Fun With Frisian: BESKERMJE - "to protect"
The words for this lesson are the verb beskermje, "to protect," and the noun beskerming, "protection." ...hie ik oanstriid om him te beskermjen. ...I had a desire to protect him. Hie is pronounced similarly to the English word "he" and is the first- and third-person past tense of hawwe, "to have." Ik has shown up in many previous lessons. It means "I" and is pronounced like the English word "ick." Oanstriid means desire or inclination." It is said with a long "oh" like in "boat" followed by a schwa-like vowel. The second syllable takes a long "ee" as in "street." Final consonants tend to be devoiced and stress is on the first syllable. OHuhn-street. Om was in a previous lesson. Him is pronounced like its English twin. Te takes a schwa and means "to." Beskermje means "to protect," "to promote," or "to encourage." The first syllable (be-) takes a schwa, the middle syllable takes a short "eh" vowel, and the last syllable has a -y- gliding into a schwa. Buh-SKEHr-myuh. Better protection of Flylân and Skylge: higher dunes. 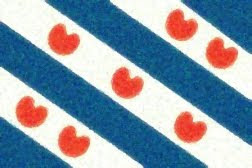 Flylân (or Vlieland) and Skylge (or Terschelling) are two islands off the coast of Friesland.